Like to meet the best and hairiest lifeguard? Cornwall is famous for many things but one of their greatest claims to fame is lifeguard Steve Jamieson and his beautiful dog Bilbo. Steve and Bilbo were celebrities for eleven years and for five of those they demonstrated as a lifesaving team. Whenever Steve trained, so did his dog. Bilbo is a Newfoundland. You may have read in one of our previous blogs about the history of their breed working with people on boats and from the shore as they are exceptional swimmers and love the water. If smaller boats capsized the dogs would tow men back to a mother ship. The Newfoundland has almost webbed feet with skin between their toes coming very close to the front of their foot. They don’t just dog-paddle but they ‘power-paddle’. Bilbo adored Steve and preferred his company to toys and the like. Bilbo’s favourite treat was some roast chicken and he used to enjoy a lick of the ice-cream spoon aswell. They used to go visiting schools to present water-safety talks and the children were enthralled by this beautiful big dog. As one person from the local area reported, Bilbo’s presence also made a significant difference at the beach. Because so many people were drawn to him, it gave the lifeguards an opportunity to pass on safety messages. The first year his presence graced the beach there was almost half the seasons average rescues. 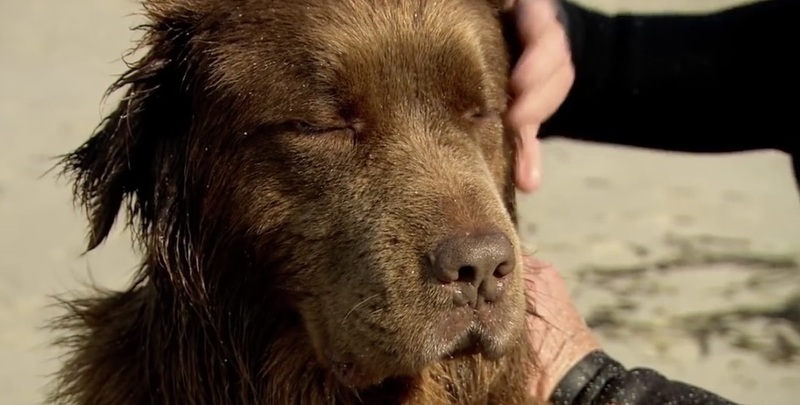 Also, Steve has recorded their story in a book called Bilbo The Lifeguard Dog: A True Story Of Friendship And Heroism. A wonderful read for any dog lover.